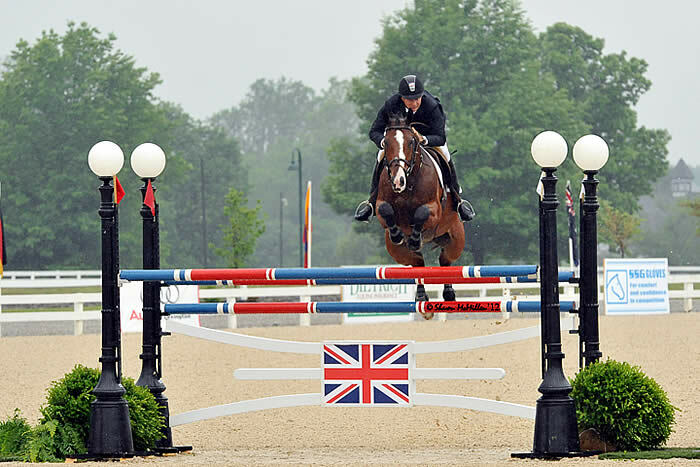 Lexington, KY – The second of four 2012 US Show Jumping Team Observation Events came to a close Sunday afternoon at the Kentucky Horse Park. With 16 entries contesting the $75,000 Commonwealth Grand Prix, which served as the second class of the Observation Event held in conjunction with the Kentucky Spring Horse Show. Grey skies and rain could not deter the 14 members of the USEF Long List for the U.S. Show Jumping Team for the 2012 Olympic Games from showcasing their talents over Richard Jeffrey’s 14 obstacle course. In the first round of competition four combinations, all from the long list, were able to produce faultless efforts and qualify for the jump-off. In the jump-off, Mario Deslauriers and Urico were untouchable as they cruised to a fault free effort in a time of 35.15 seconds and claimed top honors in the $75,000 Commonwealth Grand Prix. In the first round Deslauriers (New York, NY) and Jane Clark’s 11-year-old Dutch Warmblood gelding produced a classy clear as the final entry in the class. In the jump-off the pair, which represented the U.S. in the 2010 Alltech FEI World Equestrian at the same venue, produced another clear jumping effort utilizing efficient lines and turns. Deslauriers was very impressed with the testing track Jeffrey built Sunday. Sunday’s winning pair also rebounded from a nine fault effort in Friday’s $50,000 Hagyard Lexington Classic. Collecting second place honors in the class were long listed pair Reed Kessler and her own Mika. Seventeen-year-old Kessler (Lexington, KY) executed a stylish clear in the first round with the 12-year-old Selle Francais gelding. In the jump-off they again left all the rails in the cups in a tidy, economical round. Kessler who stands fifth on the long list with Mika was very pleased with his performance on Sunday. Beezie Madden (Cazenovia, NY) qualified both horses she brought to the Rolex Stadium Sunday afternoon for the jump-off. She collected third place honors in the class with Abigail Wexner’s 13-year-old Dutch Warmblood gelding, Simon, after rolling the rail out of the cups jumping into the double in the jump-off. Madden and Simon were the winners of Friday’s $50,000 Hagyard Lexington Classic. With Wexner’s Cortes ‘C’, Madden sliced the turn to the third vertical in the jump-off and incurred four faults, the scopey 10-year-old Belgian Warmblood gelding finished in fourth place. Eight pairs from the long list completed the course with a single mistake resulting in four faults. Christine McCrea (East Windsor, CT) and Windsor Show Stables’ Romantovich Take One left all the rails in the cups but a toe in the water resulted in four faults. Kessler on her first ride of the day Cylana, Deslauriers on Clark’s Cella and Jessica Springsteen (Colts Neck, NJ) on Stone Hill Farm’s Vornado Van Den Hoendrik all faulted at the bogey fence, 7A. Kent Farrington (Wellington, FL) and RCG Farm’s Uceko and Laura Kraut (Wellington, FL) riding Cherry Knoll Farm’s Cedric lowered the heights of fences two and three respectively in otherwise immaculate efforts. While Brianne Goutal (New York, NY) and Remarkable Farms’ Nice De Prissey collected four faults jumping out of the double combination at fence seven and Charlie Jayne riding Pony Lane Farm’s Chill R Z faulted in the middle of the triple combination, 9B. Margie Engle (Wellington, FL) and Garber, Griese, Hidden Creek and Gladewinds’ Indigo completed Sunday’s course with 12 faults and Quentin Judge (Wellington, FL) was eliminated for parting company with Double HH Farm’s HH Carotino jumping fence 10. Long list riders next head to Devon, PA in two weeks for the third 2012 US Show Jumping Team Observation Event at the Devon Horse Show. For video, news, photos and to follow the 2012 U.S. Show Jumping Team, visit: http://www.usefnetwork.com/featured/2012Jumping/. Following the completion of these observation events, FEI Nominated Entries will be submitted to the FEI on June 17. Twelve athlete/horse combinations can be named to the FEI Nominated Entries. The USOC Final Entries will be submitted no later than July 6, 2012. The 2012 Olympic Games will take place July 27 – August 12.